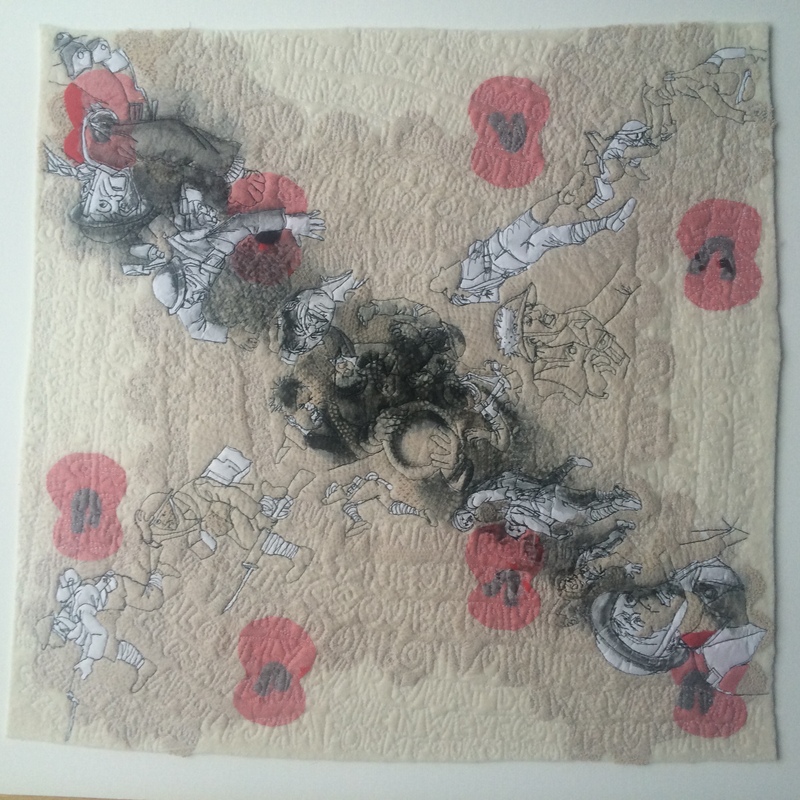 To commemorate Remembrance Day today and round off our series of themed posts by AUB students, we have a special feature by Jane Colquhoun. 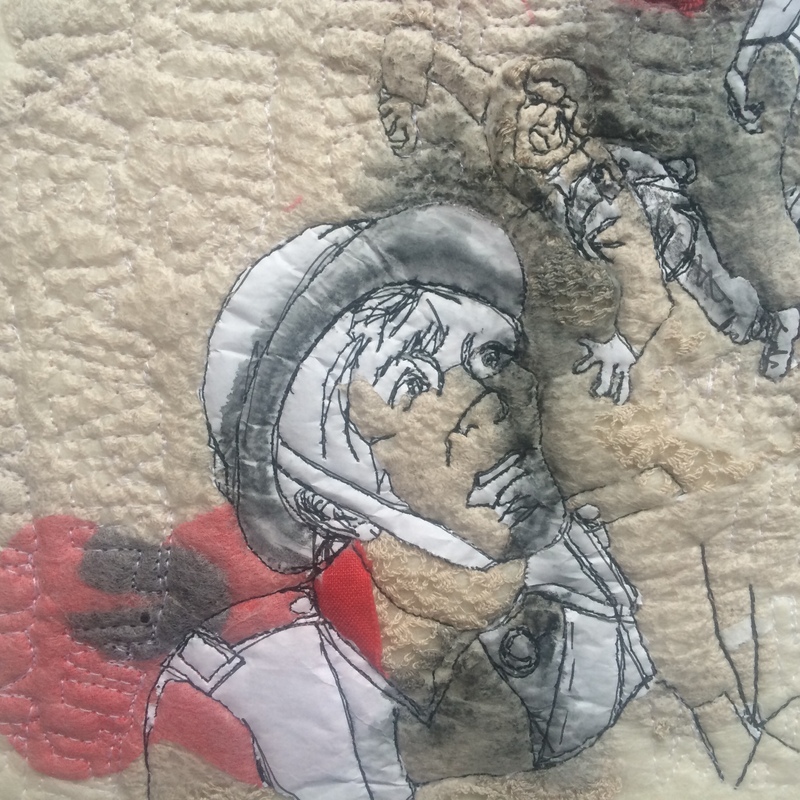 Jane Colquhoun is on MA Fine Art at Arts University Bournemouth and is the daughter of renowned comic book artist Joe Colquhoun, the artist behind Charley’s War. 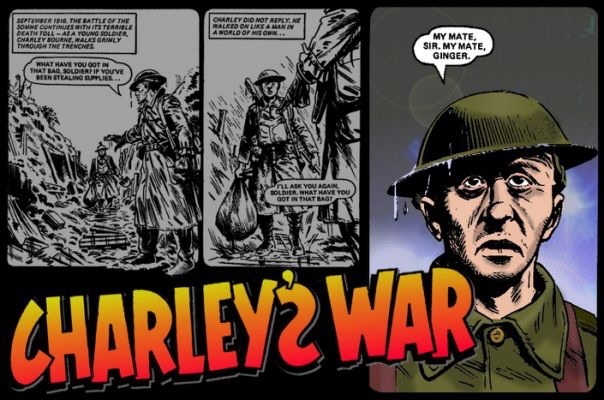 Charley’s War is considered the most important British comic war story ever. The script was written by Pat Mills with artwork by Joe Colquhoun. 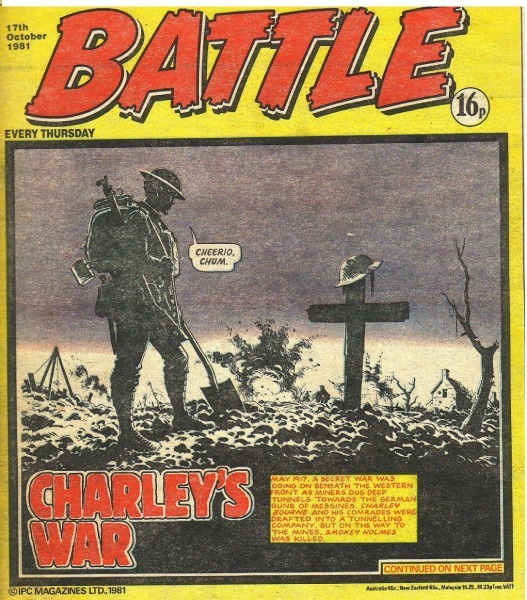 It started in early 1979 (the 200th issue of Battle Picture Weekly) and revolved around the exploits of Charley Bourne; a 16-year-old idealistic kid who lies about his age so he can leave his job at the bus garage and join Kitchener’s army as it swelled with volunteers, ready for the “Big Push” of summer 1916 (the debacle better known as the Battle of the Somme). Charley very quickly realises the real facts of the most horrific War of the Twentieth Century and turns very much the anti-hero when all of his mates are cut down on the first of July, the first day of the Somme. Last year at the centenary of the start of WW1, Joe Colquhoun’s original art work for the strip was shown in galleries in UK and Europe. 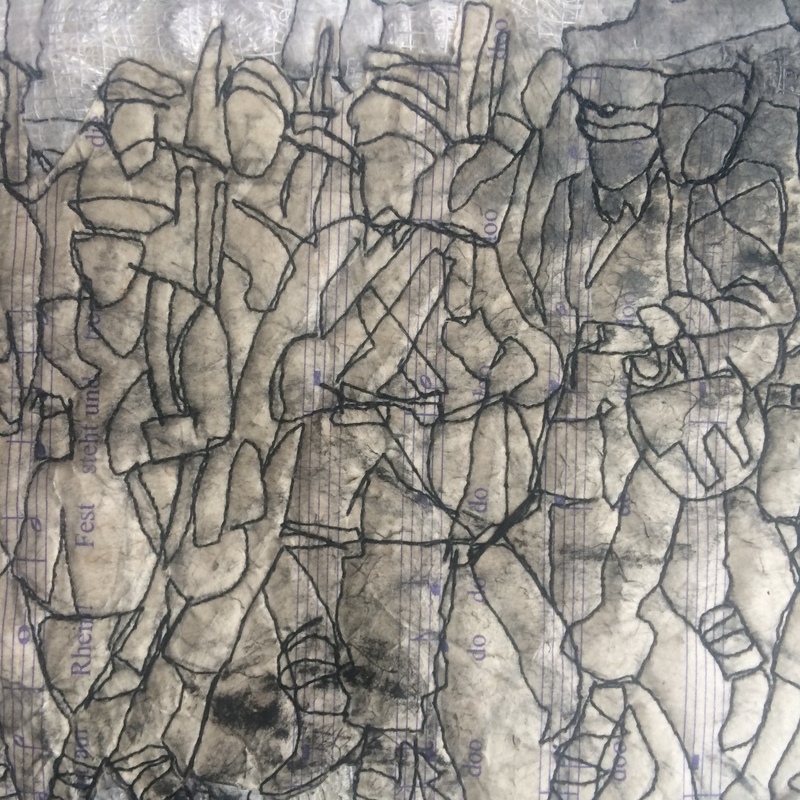 Previously work had only been shown at the Imperial War Museum and from the permanent collections held in the Cartoon Museum and Tank Museum. As part of the local commemorations I was asked to curate an exhibition of the original art work, drawn by my late father Joe Colquhoun at the Fine Foundation Gallery, Swanage. 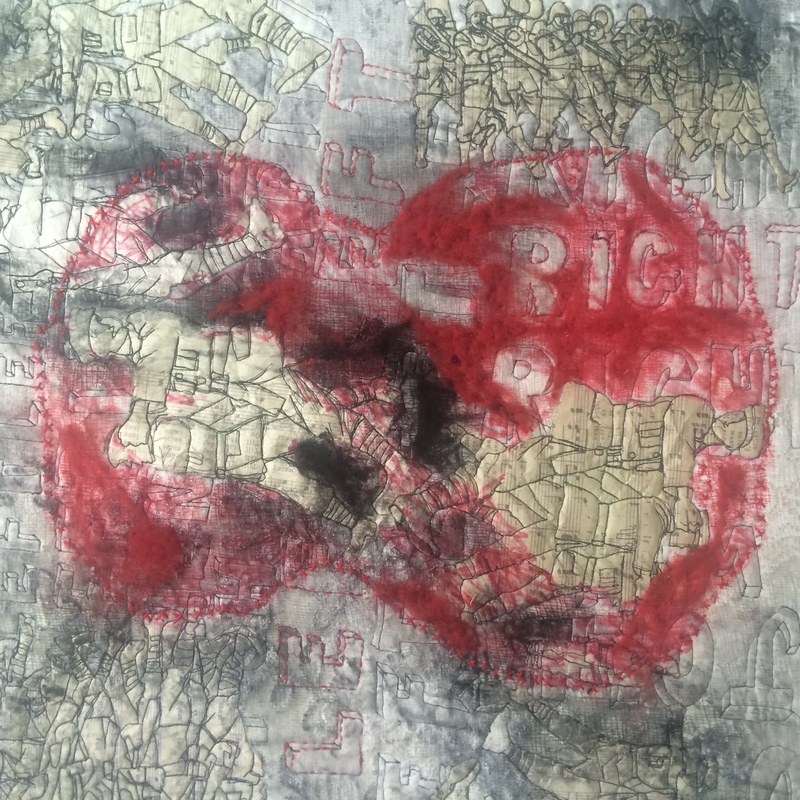 I was also asked to participate in their artist in residence programme for the duration of the exhibition. 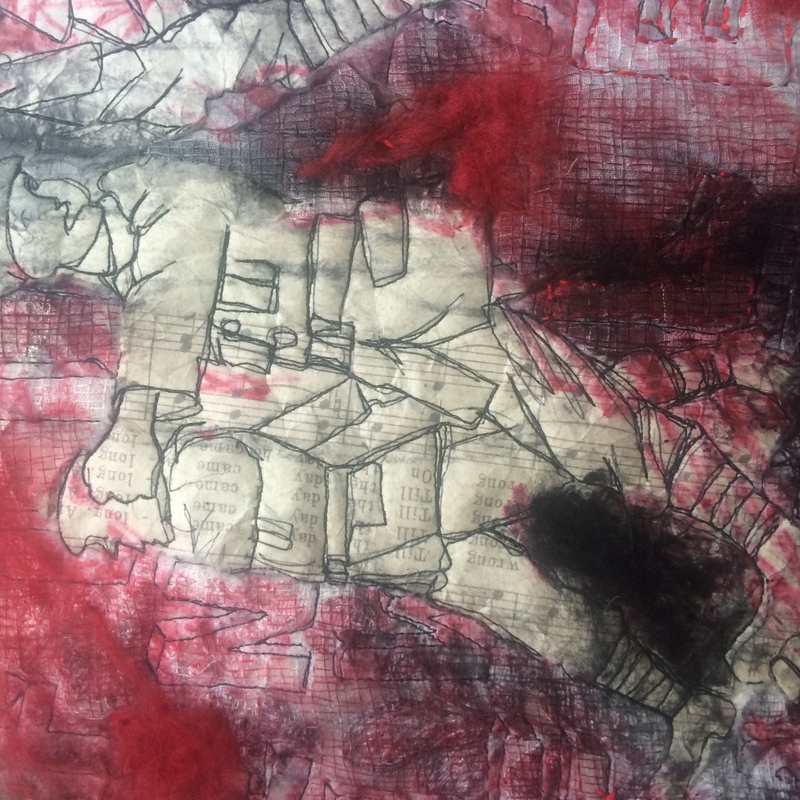 This represented quite a challenge for me as an artist more generally known for landscape based textile pieces. 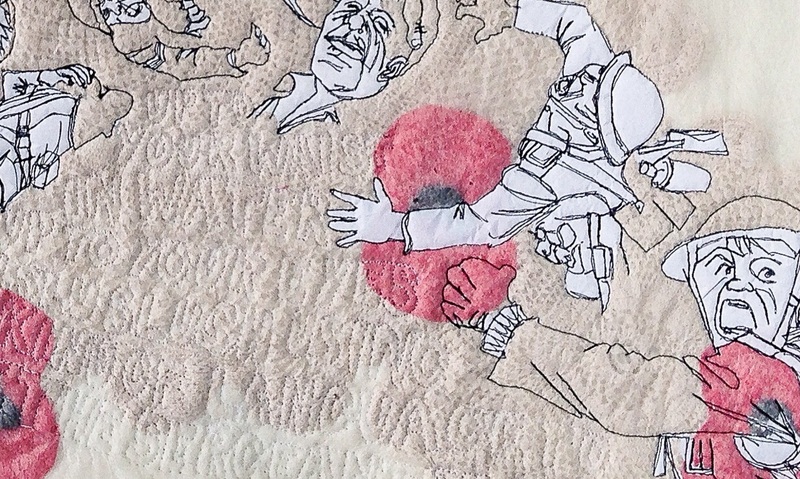 I carried out quite extensive research into my father’s working methods;his thoughts whilst carrying out the grim task of daily depicting both the horrors and tedium of life in the trenches; his collaboration with Pat Mills, the writer and his inspiration and source material. 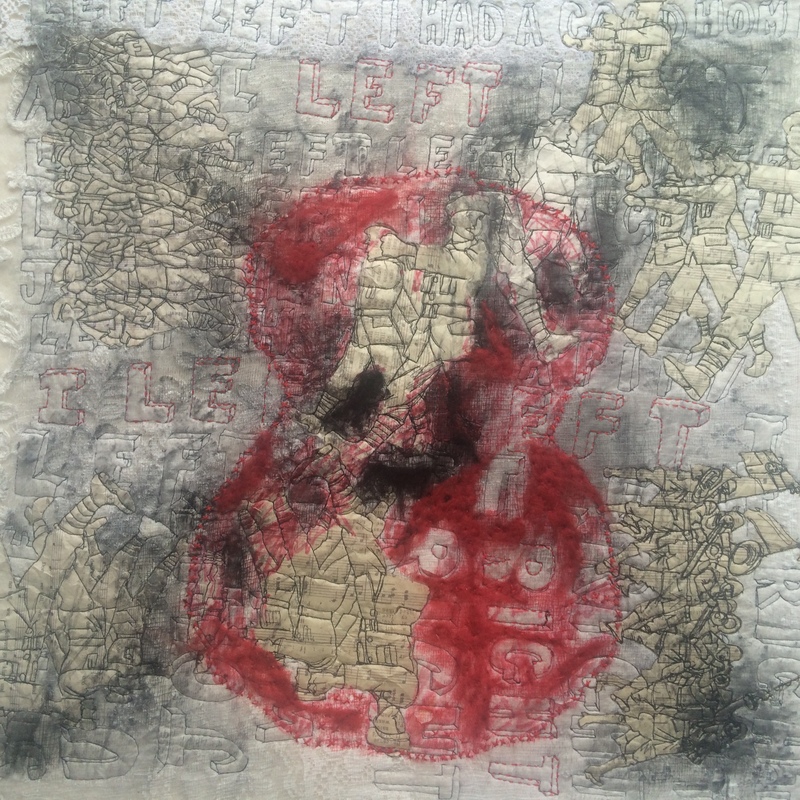 Through this close examination I became fascinated by my father’s ability to portray such a range of expressions around human misery, limited by his medium of pen and ink line work and was more able to appreciate the brilliance of the work itself aligned to a subject matter, that is as distasteful as warfare. Growing up in a family of four children solely supported by my Dad’s endeavours as a comic strip artist was something that I had taken for granted- it was just his job. The opportunity to work on a project about his art felt like I was both honouring his achievements and commemorating his loss. I was concerned about how the whole act of remembering the War through the centenary commemorations could be about glorifying war, rather than honouring the memory of the men who had lost their lives and how this affected families. For this reason, part of my research included a look into the military archives to trace the local men listed on the local Warmemorial in Swanage. One of the issues that I found really fascinating were the methods of maintaining morale, with humour, often in the form of comics, or marching songs. 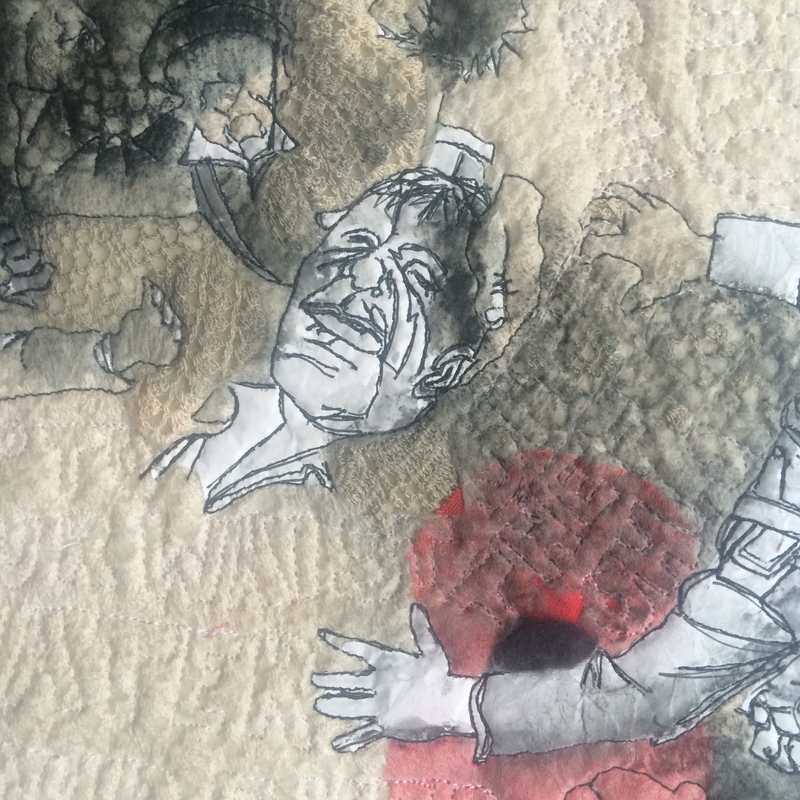 The text embroidered faintly in the background of my pieces comes from these songs and the fabrics have been layered and re-embroidered with figures from the strip to create a density that I feel represents the layers and layers of men who went ‘over the top’.